GLENWOOD SPRINGS – Aaron Pattillo didn’t set out to be in the clothing business per se, but his interest in the growing arena of “social entrepreneurship” led him in that direction after a recent visit to the Himalayan region of southwest Asia. 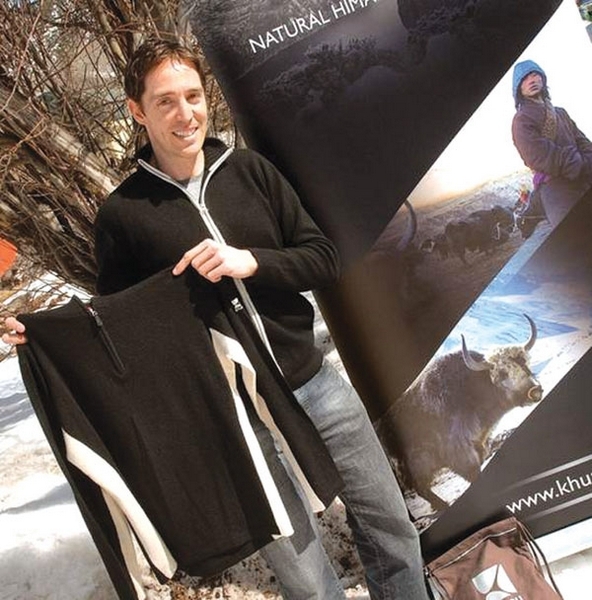 The 34-year-old Glenwood Springs native is now executive director of Khunu Limited, manufacturers of a new line of adventure wear using yak wool sourced from the nomadic communities living on the Tibetan Plateau. Pattillo, a 1994 graduate of Glenwood Springs High School, spent the last four years working with the William J. Clinton Foundation in Beijing, leading the foundation’s efforts in China and southeast Asia to work with pharmaceutical companies to help reduce the price of HIV/AIDS drugs in developing countries. But it was on a skiing trip two years ago to the Kashmiri outpost of Gulmarg that he and good friend Julian Wilson, a former British Army captain, came up with the idea of starting a yak-fiber clothing line. “We had a general idea to do something that was socially conscious, but that would also be an entrepreneurial venture,” Pattillo said. The wool is purchased at fair trade prices from rural herders in Mongolia and Tibet, helping to create sustainable local economies and markets, he explained. In addition, 2 percent of the clothing sales will go back to the communities in the region to help supply basic needs, such as medicine and food. “The biggest value is that we’re creating a market for a commodity that isn’t even in existence yet,” Pattillo said. Yak herders use the coarsest hair from the animals for tents and ropes, but typically discard the softer fibers. Through the efforts of Khunu, that wool is now turned into yarn for making garments in modern factories in China, and has been compared in quality to cashmere. “It’s something that has a value and desire to the West, especially in the higher-end ski resort markets, so it is profit-driven in the sense that we wanted to make that connection,” Pattillo said. Khunu was the name of a nomadic people in the region that predated Genghis Khan, and for which a mountain is named today, Pattillo explained. The company had a soft launch of its goods during the Winter Olympics in Vancouver, British Columbia, last week when it sponsored Ghanaian skier Kwame Nkrumah-Acheampong, known as the “Snow Leopard,” who became the first skier from his country to compete in the Olympics. Pattillo will also host a local trunk show of Khunu’s products Thursday from 5-7 p.m. at Rivers Restaurant in Glenwood Springs. Billed as a “luxury adventure” brand, the product line initially includes knit-wear for men, such as pull-over and zip-up sweaters that can be used as mid-layer pieces, retailing for between $135 and $195. The business partners, who now also include chairman and founding investor Ian Stewart, co-founder of Wired magazine, hope to expand the line to include women’s clothing next season, as well as socks, hats and scarves. Pattillo has been in discussions with independent retailers throughout Colorado and Utah to carry the products, and the company may expand next year to include other regions of the United States as well as retail partners in Europe. The company has also recently gained international exposure with articles in the Financial Times and online at http://www.treehugger.com. Its products are available through the Khunu website, http://www.khunu.com. In addition to his work with the Clinton Foundation in China, Pattillo spent six months based in Geneva, Switzerland, helping to establish and manage the foundation’s relationship with its largest donor, UNITAID. Prior to joining the Clinton Foundation, he spent three years leading the business development efforts for the biotechnology company Xcyte Therapies in Seattle. Prior to that, he earned a BA in neuroscience from Colgate University and a master’s degree from the Kellogg Center for Biotechnology at Northwestern University. In his leisure time, he has also cultivated a passion for skiing, cycling and adventure travel.